Rift Valley fever (RVF) is a viral, insect-borne disease affecting humans and animals. It is also spread to humans by direct contact with infected livestock products. The virus causes an acute fever, most commonly observed in domesticated animals (such as cattle, buffalo, sheep, goats, and camels), but it can also cause illness in humans. RVF exists in most of sub-Saharan Africa but is commonly found in the regions of eastern and southern Africa, where sheep and cattle are raised. The virus was first identified in 1931 during an investigation into an epidemic among sheep on a farm in the Rift Valley of Kenya. Approximately 1% of humans infected with RVF virus die of the disease. By contrast, livestock are often more severely affected, for example infection with RVFV results in abortion in nearly 100% of pregnancies. Age has also been shown to be a significant factor in an animal’s susceptibility to the severe form of the disease: over 90% of lambs infected with RVF die, whereas mortality among adult sheep can be as low as 10%. Most commonly, humans are infected after exposure to blood, body fluids, or the tissue of RVF-infected animals during slaughter or following veterinary and obstetric procedures. Infection can also occur through inhalation of aerosols (“fine sprays”) produced during the killing of infected animals. 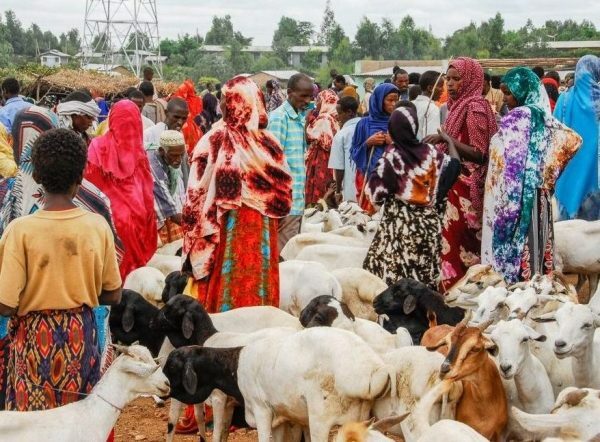 Consequently, certain occupational groups such as herders, farmers, slaughterhouse workers, and veterinarians, are at higher risk of infection. Humans can also be infected with RVF from bites of infected mosquitoes and from other biting insects, such as blood-feeding flies, through their contaminated mouth parts. The predominant type of mosquito species varies by region, but the most common vectors for RVF virus are the Aedes and Culex mosquitoes. Outbreaks of disease in animal populations are called “epizootics”- epizootic events have been observed during years in which unusually heavy rainfall and localized flooding occur. The infected female mosquito is not only capable of infecting humans that she bites, but is also capable of transmitting the virus directly to her offspring, leading to new generations of infected mosquitoes hatching from her eggs. It should also be noted that the virus can be spread by any biting insect simply through mechanical transmission of infected blood from an infected host. There is some evidence that humans may become infected with RVF by ingesting the unpasteurized or uncooked milk of infected animals. No human-to-human transmission has been documented, though it is theoretically possible if precautions are not taken. Interestingly, there has been no evidence of outbreaks of RVF in any urban areas. RVF virus has an ‘incubation period’ (the time from infection to symptoms starting) of 2-6 days and can cause either a self-limiting mild disease, or can progress to more severe disease syndromes. In nine out of ten people, there are either no symptoms or merely a mild “flu-like” illness associated with fever, generalized weakness, back pain, and dizziness at the onset of the illness. Some patients also develop neck stiffness, sensitivity to light, loss of appetite and vomiting; in these patients the disease, in its early stages, may be mistaken for meningitis. Typically, patients recover within a week of the onset of illness. Eye disorders – lesions on the eyes causing visual disturbances, 1-3 weeks after the mild illness. These lesions usually disappear within 3 months, but half of those affected will have some degree of permanent vision loss. Brain inflammation (“encephalitis”) occurs in less than 1% of those affected, causing intense headache, loss of memory, hallucinations, confusion, disorientation, vertigo, convulsions, lethargy and coma. This presents up to a month after the initial symptoms start and can result in permanent neurological deficits, but only rarely does it lead to death. Bleeding disorders as a result of liver failure can also occur. This often begins with ‘jaundice’ (yellow skin and eyes), followed by bleeding of the gums, skin and nasal passages. Patients can then suffer bloody stools, and hematemesis – vomiting blood. This is rapidly fatal in up to 50% of those affected. The early symptoms of Rift Valley fever are varied and non-specific, making clinical diagnosis difficult. RVF is similar to several other viral haemorrhagic fevers as well as many other diseases that cause fever, including malaria, dengue, shigellosis, typhoid fever, and yellow fever. Diagnosis can be confirmed in the early stages of disease (typically 4-7 days after infection) by analyzing samples of blood taken from the patient. The virus is detected by specific laboratory techniques that require sophisticated investigations such as ELISA or PCR. Blood tests are also positive for RVF-specific IgM antibodies at an early stage, soon returning to normal levels – weeks later, RVF-specific IgG antibodies become detectable and these persist for several years. Because most human cases of RVF are mild and self-limiting, a specific treatment for RVF has not been established. Treatment of the rare, but serious cases is generally limited to supportive care, usually in an Intensive Care Unit if available- and often required if bleeding or liver failure occur. Minimize contact with blood, body fluids, or tissue of infected animals, by wearing protective equipment and face masks. Prevent bites from infected mosquitoes and other bloodsucking insects by applying mosquito repellents, wearing sensible clothing, and the use of window screens and bed nets. Initiate a sustained programme of animal vaccination. Animal immunization must be implemented prior to an outbreak if an epizootic is to be prevented. Different types of vaccines are available for veterinary use: the live-attenuated vaccine, MP-12, has demonstrated promising results in laboratory trials in domesticated animals but more research is needed before the vaccine can be used in the field, whereas the live-attenuated clone 13 vaccine is currently used in South Africa. Alternative vaccines are in development. Restrict or ban the movement of livestock in order to slow the expansion of the virus from infected to uninfected areas. Establish environmental monitoring and case surveillance systems in human and animal populations, to aid in the prediction and control of future RVF outbreaks. No vaccine is currently available for human use. An inactivated vaccine has been developed for human use but it is not licensed and is not commercially available. It has to date only been used experimentally to protect veterinary and laboratory personnel at high risk of exposure to RVF. Other candidate vaccines are under investigation. Rift Valley fever (RVF) is a viral infection which can be spread by infected mosquitoes and other biting insects. However, the majority of human infections result from contact with the blood or organs of infected animals. RVF primarily affects animals but can also infect humans. No human-to-human transmission of RVF virus has been documented. Symptoms are mild in the vast majority of cases, and include: fever, headache, muscle aches and dizziness. Serious complications occur in about 10% of humans, with visual disturbances, liver failure and bleeding disorders resulting – it can sometimes be fatal. There is no human vaccine: bite prevention and strict measures when dealing with potentially infected animal products are important. Outbreaks of RVF in animals can be prevented by a sustained programme of animal vaccination.